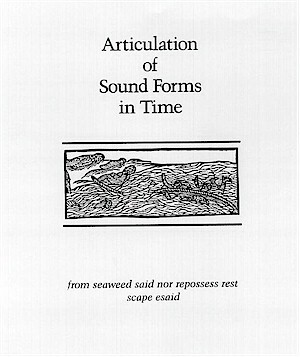 In response to the question, “Where does the title come from?” Susan Howe responds that she thinks title of the poem, Articulation of Sound Forms in Time, is “a definition Schoenberg gives to music,” while also having found a similar definition to language in the 1828 Webster’s dictionary (Talisman Interview, The Birthmark: unsettling the wilderness in American literary history 172). The acoustic shapes of rhetoric depend on faith, precisely because they lack referential meaning. “To an almost alarming extent—alarming for me, sound creates meaning. Sound is the core. If a line doesn’t sound right, and I do always have single lines or single words in mind, if a line doesn’t have some sort of rhythm to it, if my ear tells me it’s wrong, I have to get rid of it, or change it, and a new meaning may come then.” (Howe, Difficulties Interview I 31). The phrase could also simply describe voice, the vocalization of speech, and the speech-act of utterance. One’s vocalization in time carries with it an independent identity. No two voices sound quite the same. Meanwhile, written text forms the illusion of sameness across time due to its visible sameness in copied reproduction through time, which reifies the subjective temporality of a speech act. “The greatest literature shows the impossibility of self-fulfillment through desire” (René Girard Mimesis and Theory: Essays on Literature and Criticism, 1953-2005 “Conversion in Literary Christianity” 267). According to Charles Lloyd Cohen: “True piety consists in consciously turning back from sin to embrace God, reversing one’s earlier path” (God’s Caress: The Psychology of Puritan Religious Experience 5). Emmanuel Levinas: “A work conceived radically is a movement of the Same towards the other which never returns to the Same” (CP 91; italics in original). “The idea of conversion is much more than reform, repentance, re-energizing, repair, regeneration, revolution, or any other word beginning with ‘re’ which suggests a return to something that was there before and which therefore limits us to a circular view of life and experience. In Christian conversion, a positive change is connoted which is not caught inside a circle” (René Girard Mimesis and Theory: Essays on Literature and Criticism, 1953-2005 “Conversion in Literary Christianity” 267). Primitive referred to a prior time in the history of the species, in terms of evolutionary time. Europe came to be mythically conceived as preexisting colonial, global, capitalism and as having achieved a very advanced level in the continuous, linear, unidirectional path. Thus, from within this mythical starting point, other human inhabitants of the planet came to be mythically conceived not as dominated through conquest, nor as inferior in terms of wealth or political power, but as an anterior stage in the history of the species, in this unidirectional path. That is the meaning of the qualification “primitive” (Quijano 2000b, 343–44). (Cited in Maria Lugonés “Heterosexualism and the Colonial / Modern Gender System” 192).